To counteract it, the Ethiopian Airlines pilots responded with at least some of the steps that Boeing and the US Federal Aviation Administration recommended after the first accident. But amid a chorus of confusing alarms, they also made a critical oversight as they struggled for control, according to three pilots with experience in accident investigations: They left the engines set nearly to maximum. 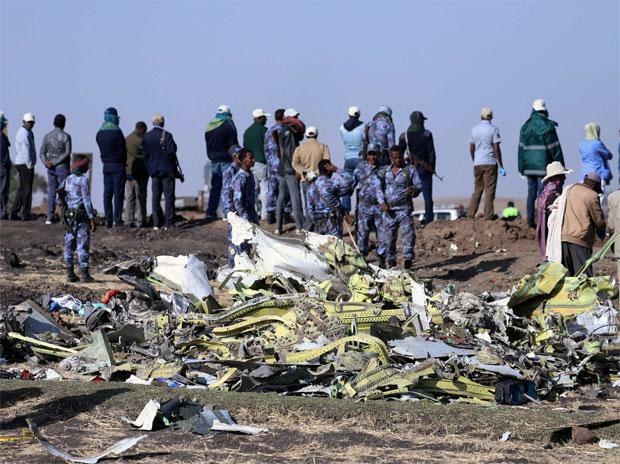 Ethiopian safety officials stopped short of saying the plane needs a redesign. That helped boost Boeing’s shares 2.9 percent to $395.86 at the close in New York, paring the decline since last month’s crash to 6.3 percent. Still, the two disasters in five months have pushed Boeing into one of the biggest crises in its century-long history. The crash in Ethiopia resulted in the worldwide grounding of the 737 Max, the revamped version of a plane model that accounts for a third of Boeing’s operating profit. The accidents also prompted multiple investigations and reviews -- including a criminal probe led by the U.S. Justice Department -- of how U.S. regulators certified the flawed anti-stall system, known as MCAS. “We at Boeing are sorry for the lives lost in the recent 737 Max accidents,” Chief Executive Officer Dennis Muilenburg said in a video. The Chicago-based planemaker blamed the accident on “a chain of events” and acknowledged the sensor malfunction. Some took issue with Ethiopia’s transport minister, saying the Ethiopian Airlines pilots had actually failed to properly follow the procedures. Other pilots said the flight crew’s actions were understandable given the chaotic situation.But they all agreed that the speed was critical.